Club Penguin Cheats by Mimo777 Club Penguin Cheats by Mimo777: Rookie is Pooped! 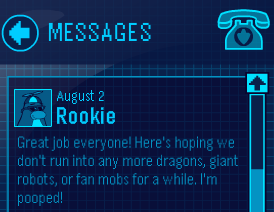 Rookie has sent us a Club Penguin message! Rookie is "pooped!" Ha ha! Now that's phunnie, don't you think? i think ur pooped up ha! Lol, that's funny! I can't believe he actually said that!!! Lol I just fell out of my chair and hit my head Laughing LOL!